To celebrate the ten year anniversary of their classic album, Colors, Between The Buried And Me will embark on a special tour this September/October, which will see the band perform the record in its entirety! 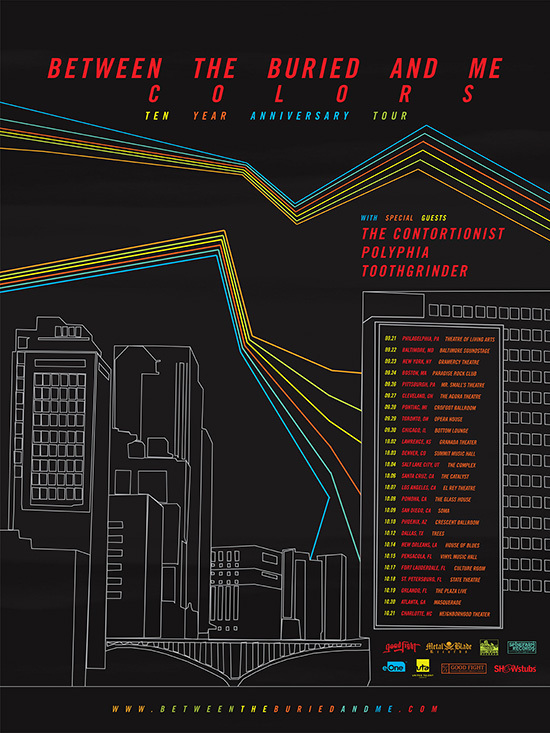 Dubbed the “Colors Ten Year Anniversary Tour”, the trek also features The Contortionist, Polyphia, and Toothgrinder as support. Between The Buried And Me comments: “‘Colors‘ was our statement of rebellion. We were challenging how others identified us in the context of heavy metal, and ultimately we were challenging how we identified ourselves. It was some kind of musical manifesto, in which we found new purpose and direction simply by throwing caution to the wind and purging every ounce of creative energy we had, regardless of how unhinged it may have seemed at the time. Tickets on sale to the general public Fri. May 19th at 10AM local time. Check local listings for details or visit @BTBAMOfficial on Facebook. See below for all dates!